The perfect finger food to start an evening of tasty delights. Lay the ciabatta slices on a baking tray and rub the garlic on each slice. Drizzle with olive oil and season with salt and pepper. Bake for 5 minutes or until the bread starts to brown and crisp. Meanwhile, in a medium bowl, toss the hazelnuts or walnuts with the dates, honey and vinegar. 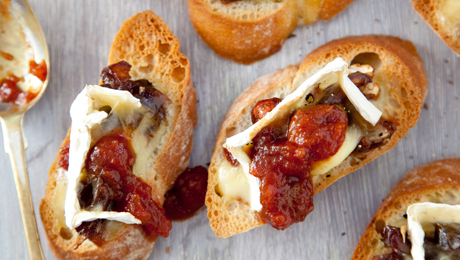 While the bread is still warm, spread with tomato chutney, add some cheese and then top with the date and nut mixture. Place under the grill for 2 minutes, until the cheese is melted and soft.